Do you think there’s been more cyberbullying in the last few years? Matthew: Yes, because of the development of the Internet. People are less shy online, so they will say anything. The sad thing about cyberbullying is that no one can stop it. Even if it’s deleted, it’ll stay in that person’s memory. Anna: There are websites for teens and kids that warn you before you open a message with bad words. As technology advances, we could develop something similar for bullying; it could detect if a message is insulting and just delete it automatically. John: But people have the right to express what they want to say and it’s not right to control them. In a way, that’s kind of bullying too; it’s abusing others’ rights. Rebecca: Without specific rules and consequences outlined on social media sites, people think it’s OK to post someone’s picture with insulting words online. There should be more information sessions in school so students know what the negative consequences are. Do schools have the right to get involved with incidents of cyberbullying? Matthew: No, because if the school isn’t aware when it starts, there isn’t much they can do. The later the school gets involved, the worse the situation can become. Rebecca: It’s a school’s responsibility to get involved and their duty to educate students. We have guest speakers who come each year, but we don’t get education on how to treat and communicate with others. If a student behaves badly outside of school, the school should reflect on that and think about what it can do differently. How should schools deal with children who bully? Anna: One thing our student council does during Bully Awareness Week is send out pink papers to every homeroom so people can write to someone they once bullied and apologize. Rebecca: We also have a school counselor who can offer ways to solve the problem and talk to the people involved. Rebecca: Schools need to protect their students. They can put up more posters, and give us weekly speeches and lessons. Everyone should take [bullying]very seriously. Anna: We can’t really put it on the teachers; we have to make sure the students actually feel for themselves that bullying is wrong. Matthew: More rules won’t help if teachers don’t see [bullying]happen. Education should start young, because younger kids can learn more effectively than middle and high school-aged kids. John: Posters and presentations only work if people actually connect with them. It’s important to educate everyone about how bullying starts so we can prevent it, including the bully. Is it OK to “fight back” if you are bullied? Anna: If the person being bullied wants to be the better person, they shouldn’t fight back. If you do, you’re basically bullying too. Matthew: People should get help from someone else to fight against bullying. John: Kids who are bullied should first let the other person know what’s happening. You shouldn’t literally fight back, but stand up for yourself and let that person know that what is happening is cruel. Rebecca: It’s OK to ask for help, but the problem is that some kids are scared to ask for help. Matthew: If they do it on purpose, they’re bad people. People who bully others don’t usually feel guilty because they think they have the power to rule over someone, and that’s kind of evil. Rebecca: Bullies don’t always know that what they are doing is bad. Their intention is to make fun of someone because they think it’s funny, but maybe they’re hurting others in a way they aren’t aware of. John: It’s based on the intention. If it starts off as a joke, then they just made the wrong choice. In the end, bullies are humans too. What would you do if someone you know is being bullied? Matthew: If someone is being bullied, they should go to a teacher or to a parent for support. Rebecca: I would tell him or her that it isn’t their fault and they don’t need to be scared. What causes children to bully? Matthew: If the punishment isn’t harsh enough, the bully won’t care and will keep doing it. Other kids are scared to get involved because they’re afraid the bully will turn on them next. John: Perhaps bullies don’t always know they’re wrong; you can’t really judge the difference between right and wrong if you weren’t taught. Who is responsible for preventing bullying? Anna: Parents. They should teach their children starting from a really young age that people are different. If kids should know they’re loved, they won’t have thoughts of hurting others in any way. John: Everyone. We’re just talking about bullying in school but as we inevitably grow up, it’s important that everyone try to help out each other in moments of crisis. How can children learn to resolve differences peacefully? John: Talking to the bully directly and telling them how you feel. Educating people so they understand that everyone is different and those differences don’t make a person some kind of outlier. Rebecca: If someone sees someone else being bullied, they should stand up for that person, because then the bully will know that they’re not doing the right thing. 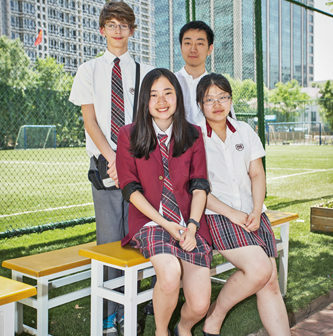 This article originally appeared on p39 of the September 2014 issue of beijingkids. To view it online for free, click here. To find out how you can obtain your own copy, email distribution@truerun.com.